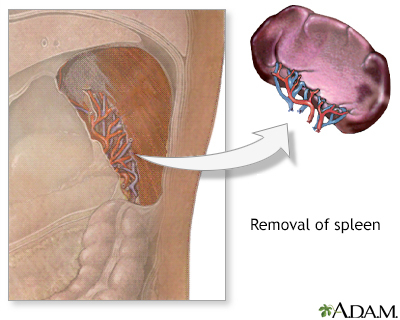 Spleen removal is surgery to remove a diseased or damaged spleen. 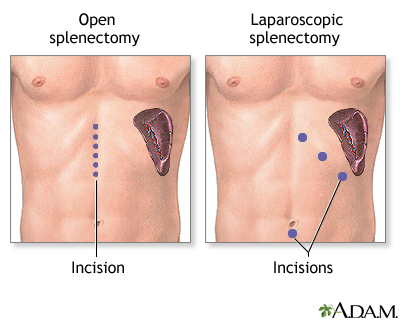 This surgery is called splenectomy. 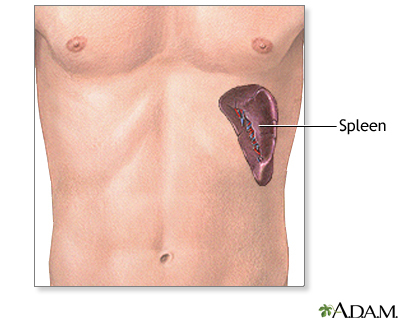 The spleen is in the upper part of the belly, on the left side underneath the ribcage. The spleen helps the body fight germs and infections. It also helps filter the blood. The spleen is removed while you are under general anesthesia (asleep and pain-free). The surgeon may do either an open splenectomy or a laparoscopic splenectomy. 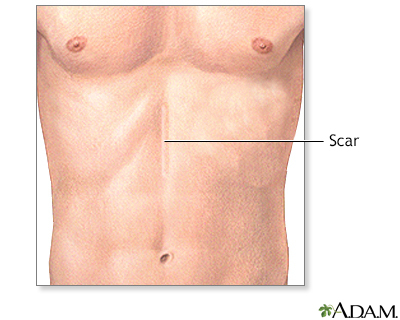 The surgeon makes a cut (incision) in the middle of the belly or on the left side of the belly just below the ribs. The spleen is located and removed. If you are also being treated for cancer, lymph nodes in the belly are examined. They may also be removed. The incision is closed using stitches or staples. The surgeon makes 3 or 4 small cuts in the belly. The surgeon inserts an instrument called a laparoscope through one of the cuts. The scope has a tiny camera and light on the end, which allows the surgeon to see inside the belly. Other instruments are inserted through the other cuts. The surgeon uses the scope and other instruments to remove the spleen. The scope and other instruments are removed. The incisions are closed using stitches or staples. With laparoscopic surgery, recovery is often faster and less painful than with open surgery. Talk to your surgeon about which type of surgery is right for you or your child. Abscess or cyst in the spleen. 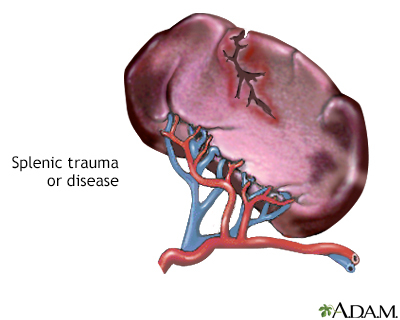 Blood clot (thrombosis) in the blood vessels of the spleen. Lymphoma, Hodgkin disease, and leukemia. Other tumors or cancers that affect the spleen. If you smoke, you should try to stop. Smoking increases your risk for problems such as slow healing. Ask your provider for help quitting. What medicines, vitamins, and other supplements you or your child is taking, even ones that were bought without a prescription. You or your child may need to stop taking drugs that make it harder for your blood to clot. These include aspirin, ibuprofen (Advil, Motrin), clopidogrel (Plavix), vitamin E, and warfarin (Coumadin). Ask the surgeon which drugs you or your child should still take on the day of surgery. Follow instructions about when you or your child should stop eating or drinking. Take the drugs the surgeon told you or your child to take with a small sip of water. You or your child will spend less than a week in the hospital. The hospital stay may be only 1 or 2 days after a laparoscopic splenectomy. Healing will likely take 4 to 6 weeks. After going home, follow instructions on taking care of yourself or your child. The outcome of this surgery depends on what disease or injuries you or your child has. People who do not have other severe injuries or medical problems often recover after this surgery. After the spleen is removed, a person is more likely to develop infections. Talk with provider about getting needed vaccinations, particularly the yearly flu vaccine. Children may need to take antibiotics to prevent infections. Most adults do not need antibiotics long-term.